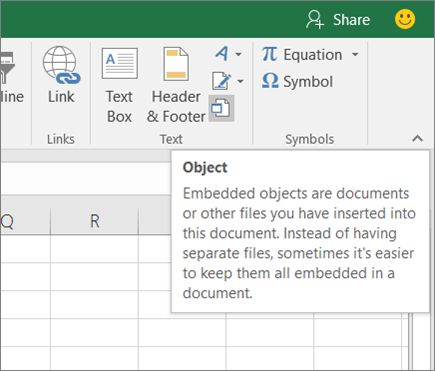 You can use Object Linking and Embedding (OLE) to include content from other programs, such as Word or Excel. OLE is supported by many different programs, and OLE is used to make content that is created in one program available in another program. For example, you can insert an Office Word document in an Office Excel workbook. To see what types of content that you can insert, click Object in the Text group on the Insert tab. Only programs that are installed on your computer and that support OLE objects appear in the Object type box. If you copy information between Excel or any program that supports OLE, such as Word, you can copy the information as either a linked object or an embedded object. The main differences between linked objects and embedded objects are where the data is stored and how the object is updated after you place it in the destination file. Embedded objects are stored in the workbook that they are inserted in, and they are not updated. Linked objects remain as separate files, and they can be updated. 1. An embedded object has no connection to the source file. 2. A linked object is linked to the source file. 3. The source file updates the linked object. If you want the information in your destination file to be updated when the data in the source file changes, use linked objects. With a linked object, the original information remains stored in the source file. The destination file displays a representation of the linked information but stores only the location of the original data (and the size if the object is an Excel chart object). The source file must remain available on your computer or network to maintain the link to the original data. The linked information can be updated automatically if you change the original data in the source file. For example, if you select a paragraph in a Word document and then paste the paragraph as a linked object in an Excel workbook, the information can be updated in Excel if you change the information in your Word document. If you don't want to update the copied data when it changes in the source file, use an embedded object. The version of the source is embedded entirely in the workbook. If you copy information as an embedded object, the destination file requires more disk space than if you link the information. When a user opens the file on another computer, he can view the embedded object without having access to the original data. Because an embedded object has no links to the source file, the object is not updated if you change the original data. To change an embedded object, double-click the object to open and edit it in the source program. The source program (or another program capable of editing the object) must be installed on your computer. You can display a linked object or embedded object in a workbook exactly as it appears in the source program or as an icon. If the workbook will be viewed online, and you don't intend to print the workbook, you can display the object as an icon. This minimizes the amount of display space that the object occupies. Viewers who want to display the information can double-click the icon. Click inside the cell of the spreadsheet where you want to insert the object. On the Insert tab, in the Text group, click Object . 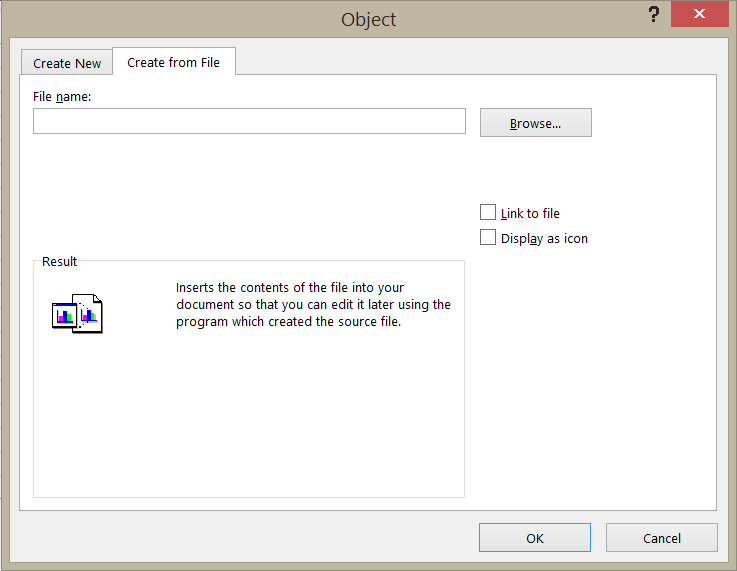 In the Object dialog box, click the Create from File tab. Click Browse, and select the file you want to insert. If you want to insert an icon into the spreadsheet instead of show the contents of the file, select the Display as icon check box. If you don’t select any check boxes, Excel shows the first page of the file. In both cases, the complete file opens with a double click. Click OK. 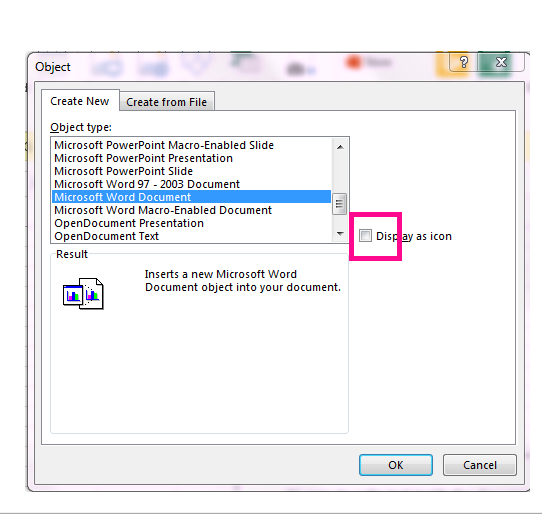 Note: After you add the icon or file, you can drag and drop it anywhere on the worksheet. You can also resize the icon or file by using the resizing handles. To find the handles, click the file or icon one time. You might want to just add a link to the object rather than fully embedding it. You can do that if your workbook and the object you want to add are both stored on a SharePoint site, a shared network drive, or a similar location, and if the location of the files will remain the same. This is handy if the linked object undergoes changes because the link always opens the most up-to-date document. Note: If you move the linked file to another location, the link won’t work anymore. Click the Create from File tab. Click Browse, and then select the file you want to link. Select the Link to file check box, and click OK.
You can create an entirely new object based on another program without leaving your workbook. For example, if you want to add a more detailed explanation to your chart or table, you can create an embedded document, such as a Word or PowerPoint file, in Excel. You can either set your object to be displayed right in a worksheet or add an icon that opens the file. On the Create New tab, select the type of object you want to insert from the list presented. If you want to insert an icon into the spreadsheet instead of the object itself, select the Display as icon check box. Click OK. Depending on the type of file you are inserting, either a new program window opens or an editing window appears within Excel. Create the new object you want to insert. When you’re done, if Excel opened a new program window in which you created the object, you can work directly within it. When you’re done with your work in the window, you can do other tasks without saving the embedded object. When you close the workbook your new objects will be saved automatically. Note: After you add the object, you can drag and drop it anywhere on your Excel worksheet. You can also resize the object by using the resizing handles. To find the handles, click the object one time. You can link or embed all or part of the content from another program. Click in the worksheet where you want to place the linked object. In the File name box, type the name of the file, or click Browse to select from a list. Select the Link to file check box. To display the content, clear the Display as icon check box. To display an icon, select the Display as icon check box. Optionally, to change the default icon image or label, click Change Icon, and then click the icon that you want from the Icon list, or type a label in the Caption box. Note: You cannot use the Object command to insert graphics and certain types of files. To insert a graphic or file, on the Insert tab, in the Illustrations group, click Picture. Click in the worksheet where you want to place the embedded object. If the document does not already exist, click the Create New tab. In the Object type box, click the type of object that you want to create. To display an icon, select the Display as icon check box. To change the default icon image or label, click Change Icon, and then click the icon that you want from the Icon list, or type a label in the Caption box. From a program other than Excel, select the information that you want to copy as a linked or embedded object. Switch to the worksheet that you want to place the information in, and then click where you want the information to appear. Right-click the icon or object, point to object typeObject (for example, Document Object), and then click Convert. To display an icon, select the Display as icon check box. Optionally, you can change the default icon image or label. To do that, click Change Icon, and then click the icon that you want from the Icon list, or type a label in the Caption box. You can set links to other programs to be updated in the following ways: automatically, when you open the destination file; manually, when you want to see the previous data before updating with the new data from the source file; or when you specifically request the update, regardless of whether automatic or manual updating is turned on. On the Data tab, in the Connections group, click Edit Links. Note: The Edit Links command is unavailable if your file does not contain links to other files. In the Source list, click the linked object that you want to update. An A in the Update column means that the link is automatic, and an M in the Update column means that the link is set to Manual update. Tip: To select multiple linked objects, hold down CTRL and click each linked object. To select all linked objects, press CTRL+A. To update a linked object only when you click Update Values, click Manual. In the Source list, click the linked object that you want to update. An A in the Update column means that the link will update automatically, and an M in the Update column means that the link must be updated manually. The Automatic option can be overridden by the Update links to other documents Excel option. Under When calculating this workbook, make sure that the Update links to other documents check box is selected. Note: The Edit Links command is unavailable if your file does not contain linked information. In the Source list, click the linked object that you want to update. While you are in Excel, you can change the content linked or embedded from another program. In the Source file list, click the source for the linked object, and then click Open Source. Make the changes that you want to the linked object. Exit the source program to return to the destination file. Double-click the embedded object to open it. Make the changes that you want to the object. If you are editing the object in place within the open program, click anywhere outside of the object to return to the destination file. If you edit the embedded object in the source program in a separate window, exit the source program to return to the destination file. Note: Double-clicking certain embedded objects, such as video and sound clips, plays the object instead of opening a program. To edit one of these embedded objects, right-click the icon or object, point to object typeObject (for example, Media Clip Object), and then click Edit. Select the embedded object that you want to edit. To convert the embedded object to the type that you specify in the list, click Convert to. To open the embedded object as the type that you specify in the list without changing the embedded object type, click Activate. Click Special, select Objects, and then click OK.
Press TAB until the object that you want is selected. Point to Object or Chart Object, and then click Edit. This message appears when the source file or source program can't be opened. Make sure that the source program is available If the source program is not installed on your computer, convert the object to the file format of a program that you do have installed. Ensure that memory is adequate Make sure that you have enough memory to run the source program. Close other programs to free up memory, if necessary. Close all dialog boxes If the source program is running, make sure that it doesn't have any open dialog boxes. Switch to the source program, and close any open dialog boxes. Close the source file If the source file is a linked object, make sure that another user doesn't have it open. Ensure that the source file name has not changed If the source file that you want to edit is a linked object, make sure that it has the same name as it did when you created the link and that it has not been moved. Select the linked object, and then click the Edit Links command in the Connections group on the Data tab to see the name of the source file. 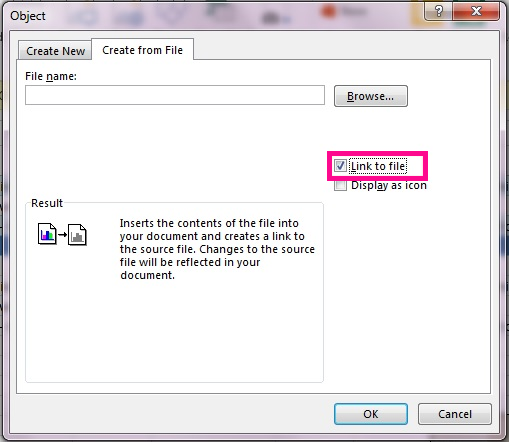 If the source file has been renamed or moved, use the Change Source button in the Edit Links dialog box to locate the source file and reconnect the link.